NOTE: Black or White Colour available. The wide variety of possible uses for our PTH110 makes it indispensable in any home. Brothers PTH110 has your household labelling needs completely covered. With an easy to use QWERTY keyboard and 3 fonts, 14 frames and more than 250 symbols available, you will be able to quickly and easily customise up to 12mm wide labels. You can even save your favourite labels for quick reprinting of up to 15 labels. Also available in Black - let us know if you prefer Black. 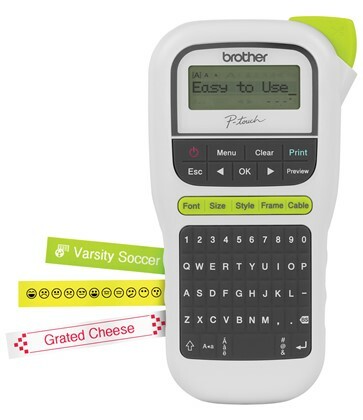 See the manufacturers web site Brother P-Touch PTH110 Label Maker for more information.